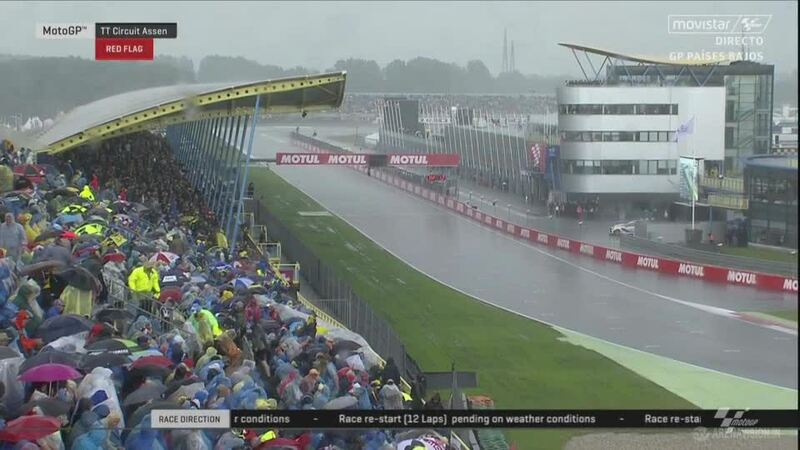 The Moto2™ World Championship race was red flagged due to rain, a torrential downpour following and ensuring that at least the start of the MotoGP™ World Championship race would be wet. 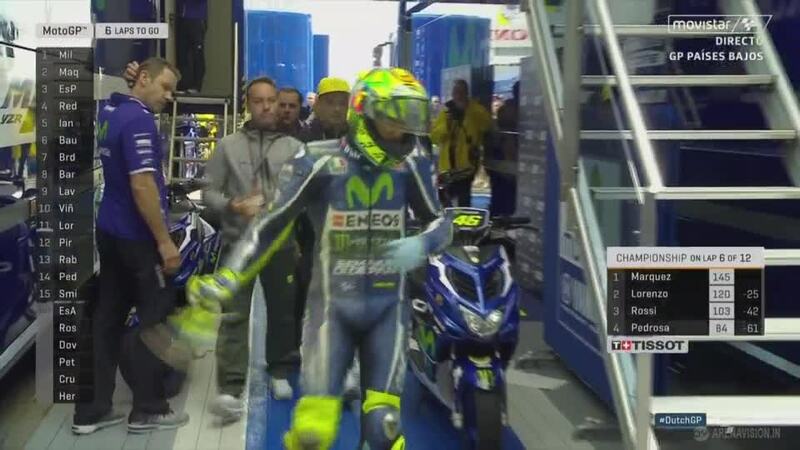 With the track soaked, the rain eased and riders headed out onto the grid with wets fitted. Conditions were far from ideal, Eugene Laverty (Aspar Team MotoGP) falling on his sighting lap. The lights went out with riders knowing a flag-to-flag race was likely, Valentino Rossi (Movistar Yamaha MotoGP) grabbing the lead out of the first corner as they tiptoed around the first corners. Andrea Dovizioso, who had led the restart, lost the front end as he attempted to stay with Rossi. He took a heavy roll through the gravel but sustained no serious injuries. This granted Rossi a comfortable lead until he crashed out at Turn 10 a lap later. Disaster for ‘The Doctor’ in a race which could have saw him right with Marquez in the championship. Known for his ability in the wet, Jack Miller (Estrella Galicia 0,0 Marc VDS) made steady progress off the line and soon found himself in second behind Marquez. After an injury hit start to the season Miller seized his chance and took the lead of the race at the final chicane on lap four. Marquez tried to close down the Australian but Miller kept his cool. 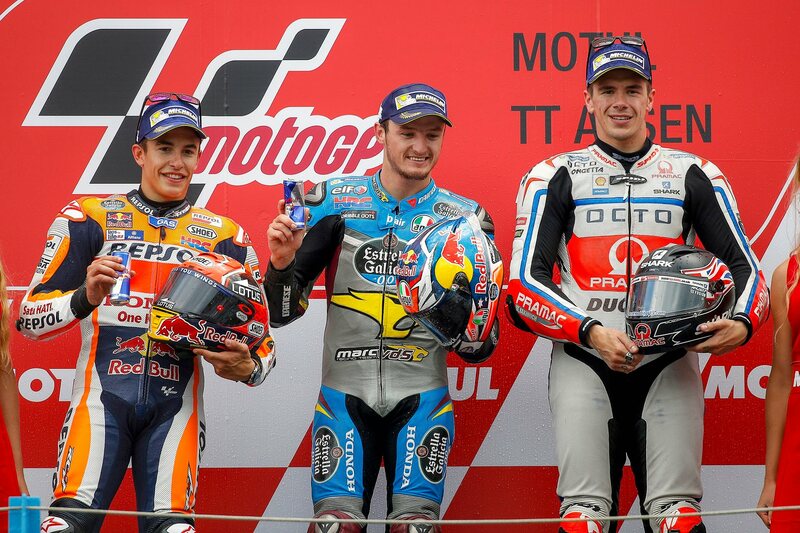 Miller’s victory is the first MotoGP™ win by an Australian since Casey Stoner’s final victory in Phillip Island. He also becomes the first rider on a non-factory bike to win a race since Toni Elias won the infamous Portuguese GP in 2006. Michele Pirro (Avintia Racing), Aleix Espargaro (Team Suzuki Ecstar) and Tito Rabat (Estrella Galicia 0,0 Marc VDS) all suffering falls. Several were able to remount, solid points on offer due to all the crashes. Against all the odds Jack Miller came out on top in Assen, beating the best riders in the world in treacherous conditions. Since he first joined the World Championship midway through the 2011 season, Jack Miller (Estrella Galicia 0,0 Marc VDS) has been known for his ability in the wet. When the heavens opened before the MotoGP™ World Championship race in Assen, Miller knew he was in with a chance of a strong result. The race went from wet to dry to wet again, torrential rain hitting the TT Circuit Assen with 12 laps to go and bringing out the red flag. The grid formed for the restart, Miller lining up in eighth position thanks to his efforts in the first stage. Once more he shot forward, soon finding himself behind Marc Marquez (Repsol Honda Team) and in a battle for the lead after a number of falls ahead. Fans around the world were pulled to the edge of their seats as the colourful Australian slipped past Marquez at the end of lap three. 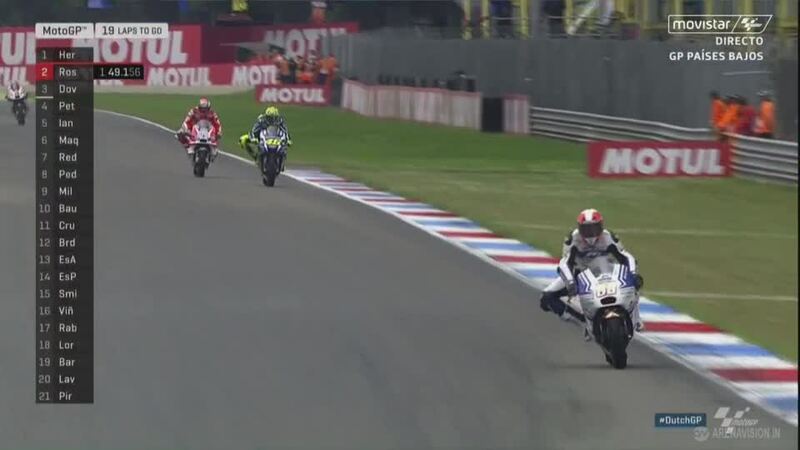 With nothing to lose, Miller pushed to open up a gap which he maintained till the end. The rain on track couldn’t stop Miller from hoisting his front wheel into the air as he celebrated a sensational first victory in the premier class. An emotional victory speech followed, the Australian fighting back the tears, thanking Honda and Marc VDS for their support after a tough start to the year. For the first time since Stoner’s last win at Phillip Island in 2012, the Australian national anthem played after a MotoGP™ race. Miller not only returned Australia to the top step of the podium but also became the first satellite rider to win a race since Toni Elias in Portgual in 2006. His victory was capped off with a ‘shoey’ on the podium, the Australia tradition of celebrating by drinking from one’s own shoe. 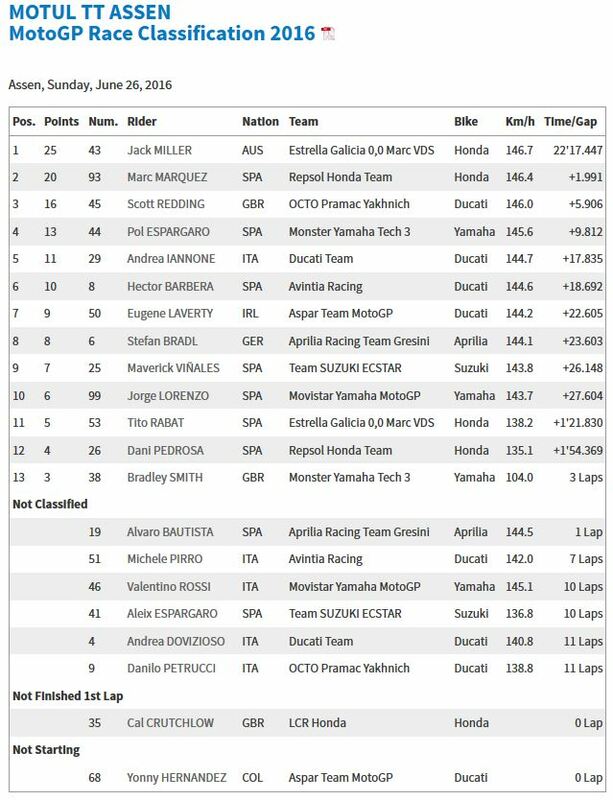 Jack Miller: “I don’t often say this but I’m lost for words. I feel incredibly emotional right now and it is hard to describe the sensation of winning for the first time in MotoGP. I felt confident and fast in the first part of the race but it was the right call to red flag it because the conditions were getting pretty dangerous. The track was really slippery for part two as well but I immediately felt comfortable. I could see a few riders making mistakes but I just kept my focus and concentrated on being fast and consistent without taking any silly risks. 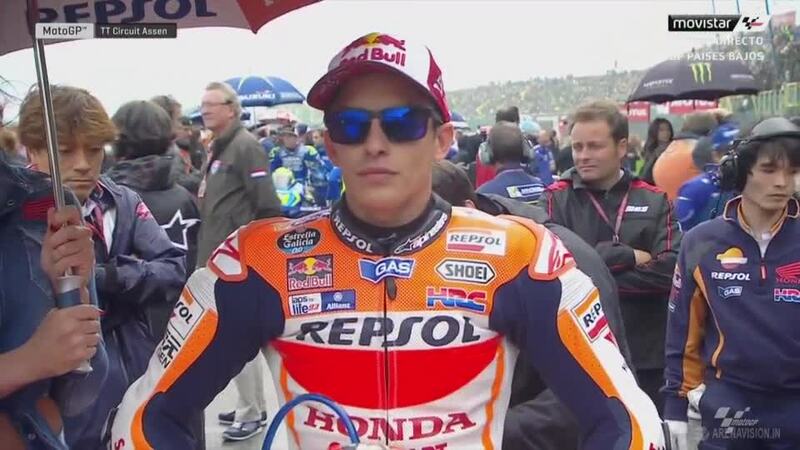 The Motul TT Assen presented Marc Marquez with a hard choice in even more difficult conditions. 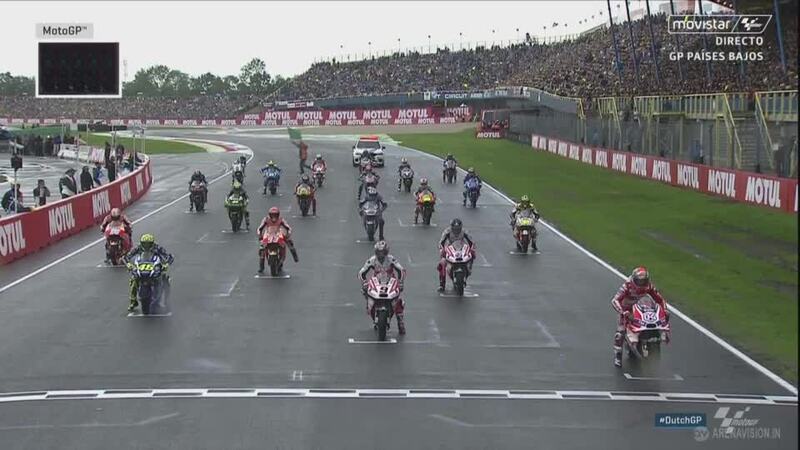 For the first time in its history, the TT Circuit Assen hosted the MotoGP™ World Championship race on a Sunday, and it proved to be a dramatic day. The 250th MotoGP™ race began on a wet track, Marc Marquez (Repsol Honda Team) making a cautious start to the race as he knew a mistake could be disastrous for his championship challenge. Once he settled in and the track began to dry, he picked up the pace and was battling with his teammate Dani Pedrosa (Repsol Honda Team) for the top five. Then the rain returned with torrential force, forcing Race Direction to pull out the red flag. For the 12-lap restart Marquez lined up in fourth, his position decided based on where he finished the last fully completed lap before the red flag. He chose to run the soft rear Michelin rain tyre and was inside the top three as they exited the first corner. Valentino Rossi (Movistar Yamaha MotoGP) and Andrea Dovizioso (Ducati Team) both sprinted off into the distance, but fell shortly after. This handed Marquez the lead, which he held until a determined Jack Miller (Estrella Galicia 0,0 Marc VDS) blasted pass. With Rossi out and Jorge Lorenzo (Movistar Yamaha MotoGP) floundering, Marquez chose to settle for second and extend his championship lead. He retains top position in the championship table and is now 24 points ahead of Lorenzo and a significant 42 points ahead of Rossi. Given the conditions on track, this is the best result Marquez could have hoped for. The next stop of the championship is Sachsenring, a track Marquez has won three straight races at. Marc Marquez: “Today’s race was one of those in which you can either lose many points or gain them, and you can face it with two mentalities: either you take a risk to gain a bigger advantage, or you focus on finishing the race in order to lose the fewest points possible. The latter is the mentality that the team repeated to me about forty times between this morning and today, and it is exactly what I did. I tried to stay in the top five so as not to drop many points to Valentino [Rossi] and attempted to not make mistakes in order to finish the race. At the beginning of the first race I didn’t feel comfortable and lost touch, but then I was able to recover. I think that stopping the race was a good decision, because it was very dangerous out there. A return to the podium for Scott Redding after a dramatic Sunday in Assen, weather reducing the race to just 12 laps. 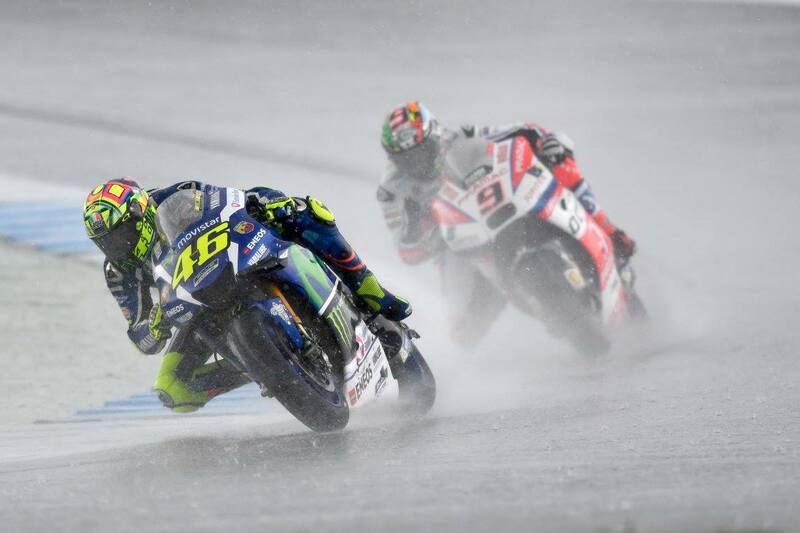 The Motul TT Assen began on a wet track, rain having stopped falling just before the race. All the MotoGP™ World Championship riders lined up with wets fitted, but if it didn’t rain they would almost certainly be forced to change bikes. From third on the grid Scott Redding (Octo Pramac Yakhnich) had a great run into, but not out of, the first corner and ended the first lap in ninth. He floated outside the top five as the track dried, but as soon as the rain returned he shot forward. The Brit soon found himself dicing for victory, until the red flag was brought out due to the rain. This saw the race restarted and run over 12 laps, Redding again making a decent start. The leaders vanished into the distance, the Brit settling in behind Independent Team rival Pol Espargaro (Monster Yamaha Tech 3). A number of high profile crashes ahead soon saw their battle become one for third, Redding grabbing his chance to pass Espargaro after multiple laps of trying. He would eventually cross the line almost four seconds ahead of Espargaro, returning to the podium for the first time since Misano in 2015. 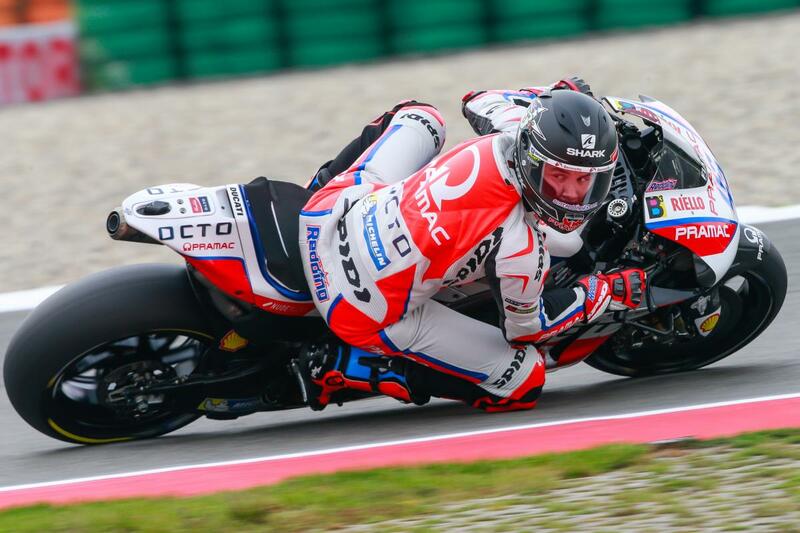 The GP15 may not be the newest Ducati machine, but Redding proved it is still more than capable in the wet. 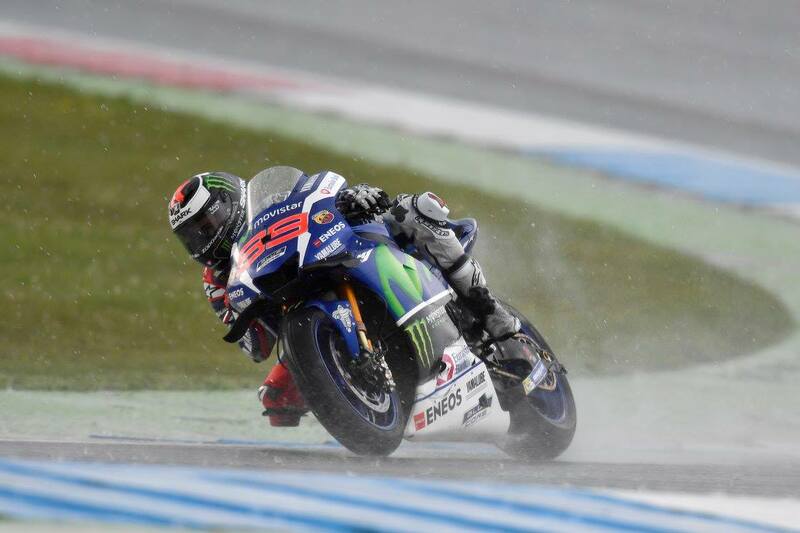 Six points for Jorge Lorenzo after a terrible Sunday in Assen, rain ruining any chance of a podium. The combination of Assen, the wet and Jorge Lorenzo (Movistar Yamaha MotoGP) is not one that has often produced great results. 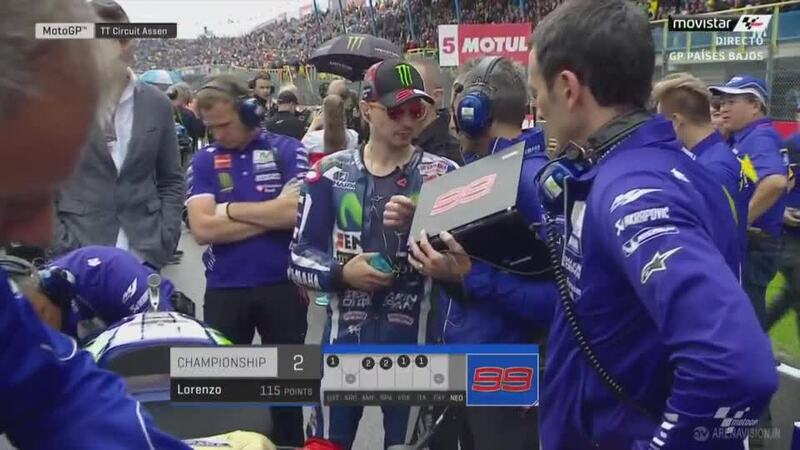 Lorenzo’s fortunes didn’t change as the 250th MotoGP™ World Championship race began on a wet track. Off the line he made a great start, aggressively working his way up to fifth from tenth on the grid within just a few corners. But then he found himself struggling as the conditions changed, the track drying out, and before long he was down in 19th position with no hope of a finish in the points. With 12 laps to go the red flag was brought out as torrential rain hit Assen, offering Lorenzo at least a chance of redemption in a 12-lap restart. From the back of the grid, Lorenzo rode a safe race in the restart, the conditions catching out a huge number of riders including Valentino Rossi (Movistar Yamaha MotoGP) and Andrea Dovizioso (Ducati Team) out the front. Progress was slow but the reigning World Champion was eventually able to pick his way up to tenth place and salvage six points. He now heads to the Sachsenring in second overall, 24 points behind Marc Marquez (Repsol Honda Team) and 18 points clear of Valentino Rossi in third.